What was the first craft brew you ever tried? What did you think? Does Weinhard’s “Blue Boar” count? If not, probably Bridgeport’s Pale Ale, I think I recall it was super bitter and flavorful, way more so than the Hamm’s I was used to drinking. Do you homebrew? If yes, favorite homebrew to date: Used to homebrew, before the whole commercial brewing thing got in the way. Favorite is a “graveyard” blended batch of 2 different Belgian strongs plus a weird barleywine with honey, cellared them away in ’09 and blew my mind drinking one on New Year’s Eve 2011->12. How’d you hear about the pdxbeergeeks? My sister told me about it. What does being a beer geek mean to you? It means that I get to be proud of knowing arcane but useful stuff about beer styles, beer history, biochemistry, and making it all come together in delicious beer that I make. If you could change one thing about beer culture in the US, what would it be? Everything is so dang far. Shrink this place down so we can walk or bike from brewery to brewery, bar to bar, taproom to… either that or keep building up brewing density and invigorating the local scenes. Oh wait, one more thing – as with country music, there is an invented “craft beer” culture that needs to be blown up. Keep the local scenes local and unique; everyone should be focusing on what’s special around them instead of elsewhere. 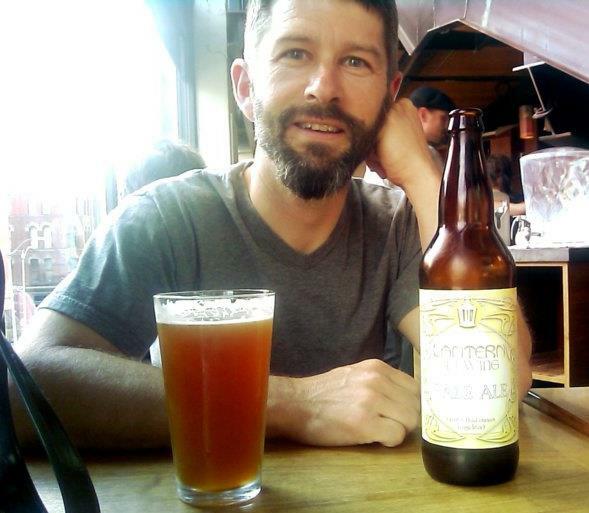 What do you love about Portland’s Craft Beer scene? That it’s vibrant and still changing, reinvigorated, and that it’s in Portland and not Seattle so when I want a change of scene I can come down and visit. Where can we find you on the web? At ‘cho web mama’s house. Or www.lanternbrewing.com, or facebook. Or whatever, the web is lame anyway, beer is better than the web.